Nature’s Greeting Plant – Magic Beans Products New Generation of Greetings! Magic Beans Products Present: The Nature’s Greeting Swordbean. It’s incredible! 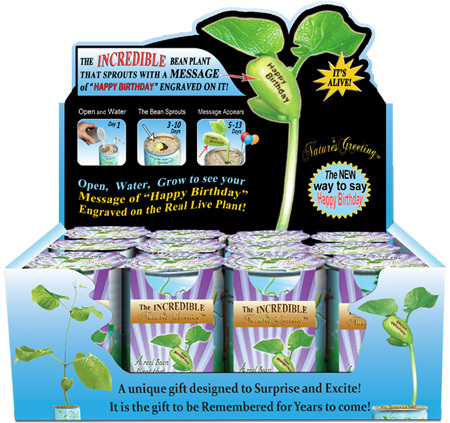 A new gift plant that quickly sprouts to reveal a secret, personal message engraved on the beautiful plant’s central bean. Just open… water… make your wish and watch your message grow, and grow, and grow. Share the wonderful spirit of any occasion with family, friends, and loved ones. However, the Swordbean is a climber, therefore it will need a trellis, fence, or wall to climb on. It will bear pods 12″ to 18″ long that look like dangling swords. 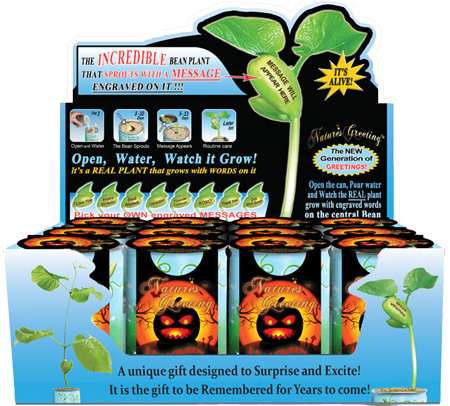 All-Included-Growing-Kit: One pre-planted bean in a recyclable container, along with special mineral soil, growing instructions in English and Spanish, drainage tab and water collector to collect all water that drains from the bottom of the container.It also comes in a vacuum sealed container to increase the shelf life of the bean. Unique gift: Instead of cluttering a drawer as traditional greeting cards usually do, Nature’s Greeting beautifies the environment and reminds the receiver daily of how special they are. All Nature’s Greeting products are a great and profitable addition to any store, appreciated by any recipient, as well as appropriate for all occasions. This unique gift idea is designed to surprise, excite, and be remembered for years to come. It will soon become as recognizable as the traditional greeting card. The Nature’s Greeting originates from the fairy tale “Jack and the Beanstalk.” In this tale, a small magical bean creates a huge beanstalk that is mysterious, romantic and offers a magical gift to its owner. Make a wish as you open the can and you will be as lucky as Jack in the fairy tale. “I Love You” will be engraved on the beautiful plant’s central Bean. 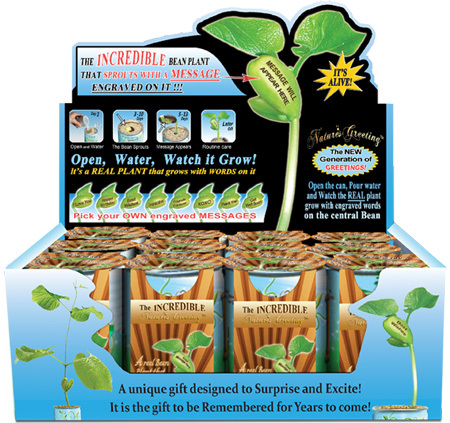 Plant the bean in the specially prepared soil, then add water and then watch the plant grow. Once it breaks through, the words “I love You” appear. Nature tells you that you are loved. Order Nature’s Greeting I Love You card. This Counter Top Display Box contains 12 units of Nature’s Greeting in a can. 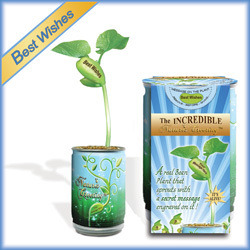 “Best Wishes” will be engraved on The beautiful plant’s central Bean contains the engraved words, “Best Wishes.” First, open the can, then plant the seed in the soil. After that, just water it and watch it grow. Watch as the message, “Best Wishes” appears. The plant grows easily. First, open the can and place the seed in the included special soil. Then, water it and watch it grow. Soon the recipient enjoys the small plant and special message it contains. Purchase this Counter Top Display Box which contains 12 units of Nature’s Greeting in a can. The central bean of this plant contains the words “Happy Birthday.” These words are nicely engraved on the bean. The container comes with simple to follow instructions. Recipients remove the lid from the can and then place the seed in the specially prepared soil. After that, they water it and watch it grow into a lovely plant with a special message. Each Counter Top Display Box contains 12 units of Nature’s Greeting in a can. This plant’s central bean contains the engraved words, “Congratulations!” Individuals who have just accomplished something big enjoy the celebratory message. Use the plant to tell someone they did a great job. Graduates appreciate it. However, so will someone who just got promoted on their job. Give this plant to anyone who is celebrating a great accomplishment. They’re going to love the unique reward! You’ll find 12 individual cans of Nature’s Greeting in this Counter Top Display Box. Like our other Nature’s Greeting products, each can contains a bean with a special message. The words, “Friends Forever” will be engraved on the beautiful plant’s central Bean. What a unique, special way to commemorate friendship. The cans open easily so the seed can be removed. After the can is opened, plant the seed in the special soil. Then, water it and watch it grow. Tell someone how you appreciate them with Nature’s Greeting in a can. Each Counter Top Display Box contains 12 individual units. “Thank You” is engraved on the beautiful plant’s central Bean. Additionally, every can contains simple to follow instructions. First, open the can, then place the seed in the specially formulated soil. After that, water the plant and wait for it to grow. Magic Beans Products includes this Counter Top Display Box which contains 12 units. These Nature’s Greeting in a can contain seeds and soil for growing a plant with a special message. 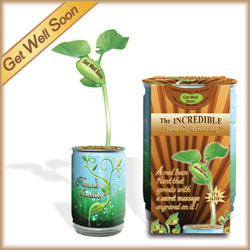 Engraved on the plant’s central bean are the words, “Get Well Soon.” Cheer up someone who is not feeling well with this unique, lasting gift. Beans grow easily, just open the can, then plant the seed in the soil. After planting the seed, water it and wait for it to grow. Our Nature’s Greeting in a can offers a unique way to express holiday greetings. This Counter Top Display Box contains 12 units. Each can comes with simple growing instructions. First, open the can. Secondly, take the seed and place it in the specially prepared soil. After that, water it and wait for it to grow. 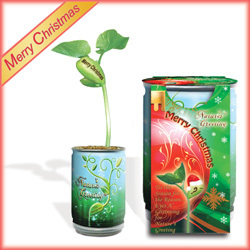 Once the plant has grown, the words “Merry Christmas” appear on the beautiful plant’s central Bean. Magic Beans Products Counter Top Display Box contains 12 units of Nature’s Greeting in a can. Give a unique gift to others celebrating this Halloween. 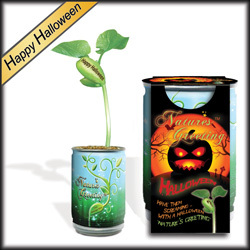 Ulitmately, recipients need only to remove the lid, then plant and water the seed in the special soil.Finally, once the plant reaches maturity, the words “Happy Halloween” appear engraved on the beautiful plant’s central Bean.